Gamma-ray bursts are violent bursts of gamma radiation associated with exploding massive stars. For the first time ever, researchers from the Dark Cosmology Centre (DARK) at the Niels Bohr Institute, among others, have observed an unusually powerful gamma-ray burst in the relatively nearby universe – a monster gamma-ray burst. The results are published in the scientific journal, Science. The Swift satellite has three instruments on board. They work together to get as much information about each gamma-ray burst as possible. The Burst Alert Telescope (BAT) is a monitoring telescope, and the first to detect a burst. The X-ray telescope and the ultraviolet/optical telescope have a coordinated field of view, so the radiation can be observed in all three wavelengths together. When astronomers observe gamma-ray bursts, they never see the original star itself. It is far too dim to be seen from their distance in the universe. But when the star dies, they can see the exploding star as a supernova. When the star explodes as a supernova, there might be a violent burst of gamma radiation. The burst is very short and is called a gamma-ray burst. Gamma-ray bursts are extremely bright and can be seen across the entire universe, but they cannot be seen from telescopes from Earth, because the Earth’s atmosphere absorbs the gamma radiation. So in order to see gamma-ray bursts, astronomers use telescopes in space. 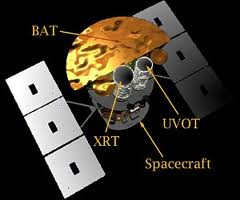 The Swift satellite, which was launched in 2004, monitors space and discovers about 100 gamma-ray bursts each year. Gamma-ray bursts are thus quite common occurrences, but in April they spotted something quite unusual. 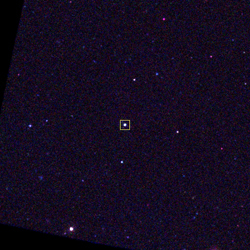 The gamma-ray burst is extremely bright and is the most luminous object in the field, as seen in the image from Swift. All the other luminous objects seen in the image are stars from our own galaxy, while the gamma-ray burst is millions of times farther away. This section shows an area of the sky that roughly corresponds to a quarter the size of the full moon. “We suddenly saw a gamma-ray burst that was extremely bright – a monster gamma-ray burst. This one of the most powerful gamma-ray bursts we have ever observed with the Swift satellite,” explains astrophysicist Daniele Malesani, Dark Cosmology Centre at the Niels Bohr Institute at the University of Copenhagen. He is affiliated with the research group at NASA’s Swift satellite and he explains that as soon as the gamma-ray burst is spotted, the satellite redirects instruments to measure X-rays, ultraviolet radiation and optical light in the visible field. It all happens very quickly, because the gamma-ray burst is over in under a minute. Then they also observe the event from telescopes on Earth. 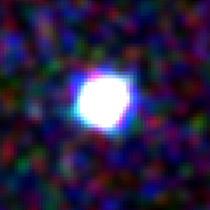 Close-up of the gamma-ray burst, taken by the ultraviolet/optical telescope on the Swift satellite. “We follow the so-called afterglow, which usually lasts a few days or for several weeks, from both Swift and from the ground-based telescopes. In this case, the burst was so powerful that we could observe the afterglow for several months. By analysing the light from the afterglow, we can study its spectral composition, which can tell us about the properties of the original star. What we have discovered is that it is a giant star with a mass that is 20-30 times the mass of the Sun, and rapidly rotatng. But its size is only 3-4 times that of the Sun, so it is extremely compact. These kinds of stars are called Wolf-Rayet stars,” explains Daniele Malesani. They have also been able to localise the star in a galaxy in the relatively near universe. The gamma-ray burst exploded when the universe was 9.9 billion years old and it has taken the light 3.75 billion years to reach us on Earth in our galaxy, the Milky Way.